It’s that time of year again when 148Apps and users select the Best App Ever. Mathemagics was a finalist in 2009. The app has improved tremendously since then and we’d love to make it to the top of the heap this time around. Below are a few categories that we have been nominated in. Click one of the links to cast your vote for Mathemagics in one of the following categories. To vote simply click one of the links above and then click the big orange “Nominate this app” button on the resulting page. That’s it. The conventional wisdom says that a Lite version of your app draws in more sales to your paid app1. In my experience this has been true. Generally, the Lite version offers a limited experience with an option to upgrade to the full app at a certain point. The Lite version should offer just enough content or functionality to give the user an idea of what the app is like and still leave them wanting more. Getting this balance correct is crucial to the success of the Lite-to-Paid conversion. Other factors also come into play such as the verbiage used at the point of decision. In order to determine the optimum text I decided to A/B test the text on the link used to launch the user over to the paid version of the app on the AppStore. The button is very visible right on the main screen of the app. Can’t miss it. When the app is first launched it randomly chooses one of four different variations of the text (I know, I know, I should probably call it an A/B/C/D test) and displays that version of the button text to the user. In order to keep things consistent the app tracks which version was selected and continues to show that version to the user from then on. The four variations that I chose were: “Buy, “Buy Now”, “More”, “Get More”. For tracking purposes I added a signature to my LinkShare link which gets tracked whenever someone clicks on the link. LinkShare not only tracks the click throughs on these links but also purchases made in iTunes which originated from a click on one of them (maybe I will cover this in another blog post if there is enough interest). The system isn’t perfectly accurate since LinkShare tracks ALL sales associated with a link rather than just the sales to the app you linked to. Meaning that if someone clicked over to your app but decided to buy the $150 Beatles Box Set instead then that sale would be attributed to the link signature that was used. However, given a large enough sample space the non-app sales should even out and give a fairly good idea of the relative sales to your app from each version of the button text. As it turns out I never really did anything with all of this. It’s been in the codebase for a year and a half. Ouch! But, what this does provide is a nice and large sample set to look at. Hopefully, I can put this info to good use at some point. Even better I hope that it is of a more immediate benefit to you. In the table the ‘Member ID’ column is the custom signature that was set in the LinkShare link (one each for buy, buy now, etc). The clicks are the total number of click throughs (CTR) from the first of June of 2009 until Feb 4, 2011. The Sales column is the total amount of iTunes merchandise purchased as a result of a click on one of the links and Commissions are the LinkShare revenue generated on those sales. The first thing that stands out are that the buttons with the text ‘More’ and ‘Get More’ generated more than twice the click throughs as the ‘Buy’ and ‘Buy Now’ links. Most likely this is due to the somewhat ambiguous nature of the the terms ‘More’ and ‘Get More’ (unintentional I assure you). I don’t really think the user knows quite what to expect when tapping buttons with those labels and purchasing the app is probably not what many expect. Or maybe it’s curiosity. What’s behind the ‘More’ button? The ‘Buy’ and ‘Buy Now’ labeled buttons set expectations appropriately. When a user taps on one of them they pretty much know that they are going to a place where a purchase may take place (aka the AppStore). While the raw number of clicks is less than half that of the ‘more’ variety the sales associated with the ‘buy’ labeled buttons confirms this. For instance, for the ‘Buy’ button an average of 0.44 sales occurred per tap (1640/3768 = 0.435). At the same time for the ‘More’ button an average of 0.24 sales occurred per tap (2261/9524 = 0.237). What does all of this tell us? While the ‘Buy’ links have a much higher conversion rate the ‘More’ links create many more click throughs and have higher raw sales numbers2. I do have to say that to me the ‘More’ style links seem a bit disingenuous in that they do not clearly indicate to the user what is going to happen. So, there you have it grasshopper. With great power comes great responsibility. Use these findings as you see fit. This post is a part of the iDevBlogADay group of Indie development blogs. Thanks to @mysterycoconut for managing such a great site. 1. Current thinking may slant more in the direction of the Freemium model where the app is free but offers an in-app purchase in order to ‘upgrade’ to the full content. 2. What this also tells us is that Lite versions do work to a certain degree as witnessed in the raw sales numbers across all variations of the label. I will say that the Lite version drove <10% of total paid app sales during that time period however. 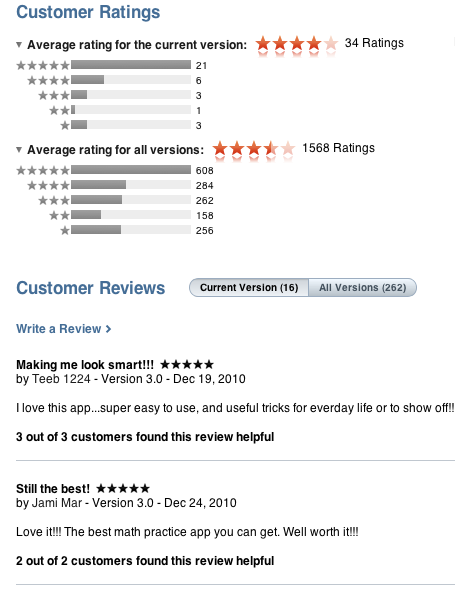 For quite some time I’ve had a dialog in Mathemagics to prompt the user to rate and review the app on the AppStore. In the fast paced world of the AppStore a user may come across your app in the store, download it, use it and never have a need to return to its page on the AppStore. Consequently a potentially happy user of your app never lets you or anyone outside of their close friends know how much they like it. 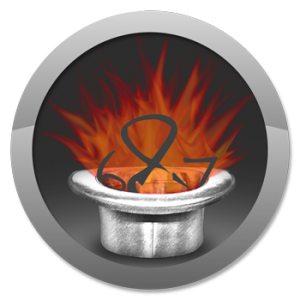 Politely asking the user for a review has been a great success for Mathemagics garnering it 262 written reviews and 1568 ratings thus far. The vast majority of the reviews are quite positive and generally come with a 4 or 5 star rating. I believe one key to this success is that the dialog asking for a review is non-invasive to the users current actions. It pops up at the end of a successful game, congratulates them, and politely asks for a review on the AppStore. If the user chooses to review the app they are taken immediately to the apps page on the AppStore. If they choose not to rate the app the dialog goes away never to be seen again. Polite and non-invasive. 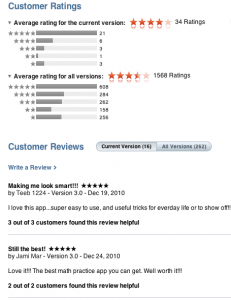 When the Mac AppStore first launched many apps had a difficult time getting user reviews. In fact, still today many apps don’t have any ratings or reviews. In the trial-less vacuum of the AppStore reviews and ratings give potential customers something to anchor their buying decision on. After Mathemagics for Mac gained enough ratings to start showing an average rating the apps ranking increased by an average of about 10 spots and has stayed there. I attribute this partially to the apps positive AppStore reviews and its star rating. Considering the success of asking for a review in the iOS version of the app it was a natural for me to add a request for a review in Mathemagics for Mac. However, I took it one step further. Not only does the app ask for a review at a certain point but it will also ask a user who has previously reviewed the app to update their review if they have not done so for the current version of the app. Tracking this is done quite easily by saving off in NSUserDefaults the current version of the app that a review was requested for and whether or not the user clicked through to the AppStore or if they declined. Using this info you can popup a dialog requesting either a new or an updated review (be extra careful to only do this once per app version). At the same time I also added a preference which allows the user to turn off all review requests if they so choose. Remember, polite and non-invasive. We’re a little over a week into the launch of the Mac AppStore and by all early signs it’s going to be a hit. I personally couldn’t be more pleased with the launch of my new Mac app, Mathemagics. In fact, it had the good fortune of being an Editor’s Pick at Macworld on Tuesday of last week. I almost fell out of my chair when I first saw the post. Macworld carries some oomph. As you can see the impact on sales was noticeable. You get one guess to name at what point the Macworld Editor’s Pick went live. Interestingly the iPhone version of the app was also positively impacted. In fact, raw downloads for the day were greater for the iPhone/iPad version of the app vs the Mac version. Though not by much. At least one new customer emailed support and mentioned that he had seen the Mac version of the app and noticed on the company website that we also had an iPhone version of the app. So, he bought that one too. Cross selling for the win! This sort of cross sell is what we hope for and this particular customer confirmed that it does in fact happen. Now, while this is great and having a decent website that clearly showcases your products played an important part in that cross sell it is not the focus of this blog post. I merely mention it and the above download numbers in order to provide a backdrop for the stats that I am about to provide. By luck or divine intervention the day prior to the Macworld selection I had a brainstorm on a way to definitively track clicks from the AppStore over to the company website. This, to me, is important. Normally, at least via Google Analytics, such clicks just show up as ‘Direct’ which basically means they could have come from anywhere. As we know, stats about who clicks where within the AppStore, how they found your app page, and where they went from there is a black hole as large as the one at the center of the Milkyway Galaxy. So, any insight into that abyss can be incredibly useful information upon which to make important business decisions. The AppStores provide a link to your company website that some users take advantage of. Currently, the iPhone/iPad AppStore resides within iTunes and has a completely different layout than its sibling the Mac AppStore. The AppStore on the device (iPhone, iPodTouch, etc) shows a truncated link to your website that is not clickable. I doubt many users take the time to enter it manually into mobile safari if they can happen to decipher it. Between the three AppStores the Mac AppStore is the most clean and the company link is clearly visible and obvious. Links in iTunes are sandwiched between a truncated version of your description and your app screenshots. I’m in the AppStore all of the time and I know where the company link is . However, I still have to hunt for it in iTunes when I want to take a further look. The company link on the device AppStore might as well not even be there. This link visibility and obviousness has a profound impact on the number of users clicking though to your website. So, how do I know who clicked directly from the AppStore? I add a parameter to the end of my landing page URL’s and use it only within iTunes Connect for the product page link. Edge cases aside this reveals the number of page views originating as a click directly on the company link within the AppStore. Google Analytics will split out the URL with unique parameters as a separate line item and my webserver will safely accept and ignore parameters that it is not interested in. As you can see the iPhone/iPad version of the app had a paltry 13 page views (s=iosas) which originated as a click from directly within the iTunes version of the AppStore. During the same time frame the Mac version of the app had a robust 189 page views (s=mas) that originated as a click from directly within the AppStore. This despite the fact that the iOS app saw slightly more downloads than the Mac app. The above stats are for the short but intense time period just after the Macworld Editor’s Pick. A longer study lasting over a several month period with more normal traffic is warranted. Just the same, I think that since both apps had similar raw download numbers over the same time frame and the Mac app page views far outweigh those of the iOS app the premise has some legs. (As an aside take a look at the Avg Time on Page stats between the two). The observed click throughs coming from the AppStores is most likely a combination of the poor design in the iTunes AppStore and the fact that most iOS purchases happen on the device. Whatever the cause it is clear that users are clicking through from the Mac AppStore to take a look at your website. Be ready for them! This is your opportunity to stand out, control the setting, and make your sales pitch. The Mac AppStore is here, the Mac AppStore is here. For the past two months or so I have been heads down creating a Mac version of my popular iOS education app Mathemagics. Mathemagics is an app to help you train for calculating math mentally. The original iPhone version was first released in March of 2009 and has seen moderate success hovering in the top 100 of the U.S. Education category for most of that time. It’s also been featured by Apple 4 or 5 times (many thanks Apple!). So, having developed for the Mac in the past, when the Mac AppStore was first announced it was a natural for me to create a Mac version of the app. I could have taken a wait and see approach but having been a part of the original iPhone AppStore launch (via another app) I knew that getting in early was worth the effort. There will never be less competition in the AppStore than there is on day one. I think we all realize that more and more apps will continue to poor into the AppStore from here on out. However, it does take significantly more effort and time to create a full featured Mac app as compared to an iPhone app so the flood may be little less torrential. The similar skill sets needed to create iPhone and Mac apps will pave the way for the initiate iOS dev to start creating Mac apps for publishing on the Mac AppStore. Although Cocoa looks like a crufty old man when put up alongside its nimble cousin it is incredibly powerful and does command a learning curve. So, there is some barrier to entry. Maybe it will be just enough to act as a high pass filter and keep the crap out but let the quality in. Only time will tell. So, how did Mathemagics do in the first few days of the Mac AppStore? Fairly well. 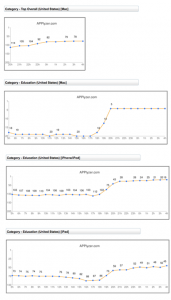 The app has been holding steady in the top 10-15 apps in the U.S. Education category. Rankings appear to be updated regularly but the volatility is much less dramatic than in the iOS AppStores. Most likely due to the lower volume of overall downloads. I suspect that ranking volatility will pick up as time goes on with more apps in the store and more users updating to 10.6.6 and discovering the new AppStore on their Mac. The top ten apps in the Education category appear in the overall top 180 apps on the AppStore putting Mathemagics somewhere outside of that range. This is in stark contrast to the iPhone AppStore where only the top 1 or 2 apps in the Education category make an appearance in the overall top 200 list. Sales over the first three days and at those rankings were fairly solid. The Mac AppStore is just getting started and it isn’t yet available to all users so the volume is much less than what you might expect to see on the iOS AppStore. It will probably remain that way simply due to the lower Mac : iOS device count. Existing Mac users will be upgrading to 10.6.6 in the upcoming weeks and I expect that influx of ‘new’ users will help to support sales a bit in the interim. At some point that boost will begin to tapper off by which time I hope that new Macs begin to ship with the Mac AppStore pre-installed. All the same it will take some time before the idea of an AppStore on the Mac begins to embed itself into the fabric of everyday users habits. The existence and mind-share of the iPhone AppStore should help to speed that process. I am pleased with the actual sales numbers. These aren’t top 10 hit numbers, nor did I expect them to be, but they do make a nice addition to the overall bottom line. Launch day had the highest number of downloads with the following days starting to trail off. Ranking slipped by a couple of slots late in the day on Saturday and that could have had a small impact on the sales numbers. In either case as time goes on and the AppStore becomes available on more and more Macs coupled with an increased awareness of the store Mathemagics for Mac could become a solid addition to my lineup of apps. In the mean time I’ll iterate like mad to increase the quality and feature set of the app in order to make it the best in its class. Eventually an increase in price of the app will accompany those improvements. I’m excited to see an AppStore on the Mac and even more thrilled to have been a part of its launch. These are the early days of the Mac AppStore and the road ahead is unknown. Secure in the experience of having lived the emotional roller coaster that is the iPhone AppStore I’m settling in for the long haul.